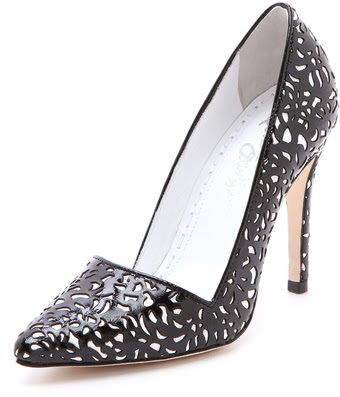 The classic pump gets a fabulously chic makeover in the Alice + Olivia Dina Patent Leather Cutout Pump. Modern touches to this classic include an angled vamp and an intricate cutout design. Add the sultry point-toe, 4 1/4" self-covered heel, and its tonal patent leather body and you get a new modern classic whose style is likely to outlast even you.